Here is THE accessory for your 12" soldier's backpack or haversack--or just tuck 'em into his jacket. 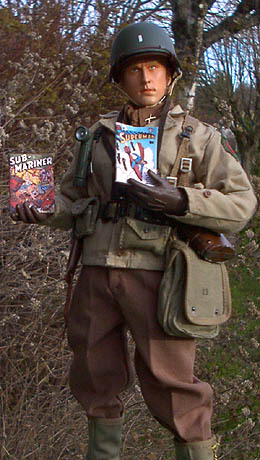 Fits Lt. Craig's document satchel (see photo at right). Diorama enthusiasts shouldn't miss out on these items! These bright, war-era covers feature an assortment of detailed imagery, from heroes battling Axis powers to scantily clad space heroines menaced by alien creatures. The real treat, however, is the back-cover wartime advertisements! Ads include "Friend or Foe" aircraft-spotters' handbook, "Bombs Away" toy bombardier cockpit, Junior Air Raid Warden kit, etc. All printing is done on a high-resolution laser printer, so you can actually read much of the text! The pages are glued together, but owners are encouraged to dog-ear the corners a little, even bend them a bit, for that used look. These are custom, homemade items and are TOTALLY UNIQUE!! of approximately 1 1/4" x 1 3/4", and 1/16" thick. 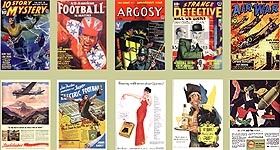 The "Tough Pulp" set of five magazines features 10 Story Mystery, All American Football, Argosy, Strange Detective, and Air War. Back covers include a strange Shell Oil ad called "Beauty and the Bomb"! The "Strange Pulps" set of five magazines features Weird Tales, Famous Fantastic Mysteries, Captain Future, Planet Stories, and Amazing Stories. Back covers include novelty and heavy-industy ads. Both sets include a "Petty Girl" cigarette ad. of approximately 1" x 1 3/8", and 1/16" thick. 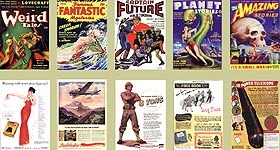 The "Superhero Assortment" set of five comics features Superman, Sub-Mariner, Hangman, All Star Comics, and Exciting Comics.